This is my pumpkin for this year's Halloween, carved together with . 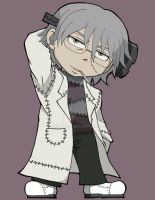 It's Franken Stein from Soul Eater! Which is coming out in English dubbed soon! I'm very excited. We don't own Stein, but we would like to. Edit: Over 100 faves? I'm astounded! Seriously, major thanks to everyone who decided that my pumpkin was worthy of adding to their collection of favorites! Why is there no fan girl pumpkin carving stencil things?! This is beautiful. I've tried doing more intricate carvings, but I always run into the issue of preserving the artwork once it's done. What's your secret? <3 <3 <3 ... I can't tell you how much I love this!!!!!! So doing his next time I gt a pumpkin! OMG this is freaking amazing. I am so doing this this year XD that is awesome! Seriously, seriously love you. And the pumpkin..
Do you think Marie would get mad if I tried to marry the pumpkin? I think this is the greatest thing ever. 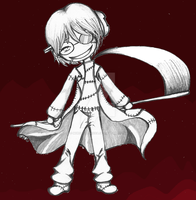 Defense of pride and foolish curiosity are the reasons, the things that tempt souls into the one forbidden place. Once there, fleeting glimpses are enough to prompt the belief that turns proud boasts into half-choked back screams. Ancient terror lurks there. It stands invisible in plain sight between crumbling walls seemingly held together by malevolent determination. An awful kind of phantom beauty possesses the place, yet appreciation is lost on those who escape after just the first taste of fear. It is lost on those who never strive to understand, choosing instead to remain secure behind their shield of ignorance.